Cost: $25 per person (includes dinner, soft drink/tea/lemonade and tip). We will be ordering a large selection of appetizers for your pre-dining socializing. Please come join your IRPCA friends for a casual dinner at a unique restaurant. The Garage Grill has been serving car clubs for years. 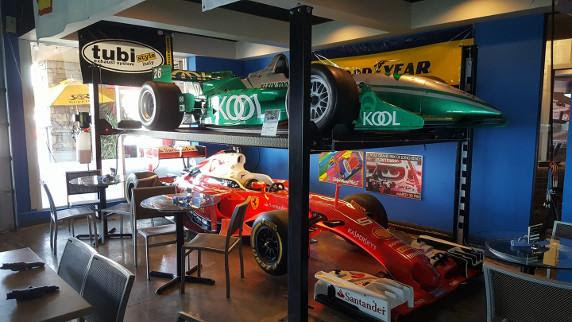 The atmosphere is car-crazy, with decor from hundreds of original banners to wall-mounted Formula 1 cars! There is plenty of parking, and we will have our own section of the restaurant to socialize and eat. The Motorsportsreg sign-up is open and has a section to order your meals. Click here to sign up. If you have any questions please contact Cary Jones at 801-631-6862 or email to bigskidude@gmail.com. Thank you again to Porsche Salt Lake for sponsoring this event!